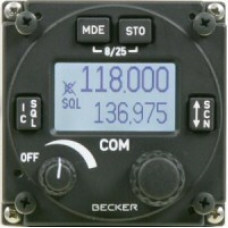 Becker Avionics International has launched a successor to the legendary AR 4201, of which over 18,000 have been built so far, that represents a quantum leap forward in performance, technical sophistication and robustness. The AR6201 VHF-AM transceiver has state-of-art DSP (Digital Signal Processing) technology. It is mountable in the 2¼ inch standard instrument panel recess and is equipped with a highly efficient AM transmitter, a very sensitive receiver and a full graphic LC-display that allows for easy reading under all light conditions, including full sun. Push button and knob operation. Display illumination can be dimmed. The AR6201 is, of course, prepared for 8.33kHz spacing that will become the new international standard for airborne communication. Switching between the 8.33 and the 25kHz mode is therefore made effortlessly simple. Standard or dynamic microphones can be used. A built-in-test facility increases flight safety. The dual watch mode that allows scanning of two different channels is an extra feature. The AR6201, with its integrated VOX/Intercom circuit, allows communication between pilot and co-pilot without the need for a separate intercom. 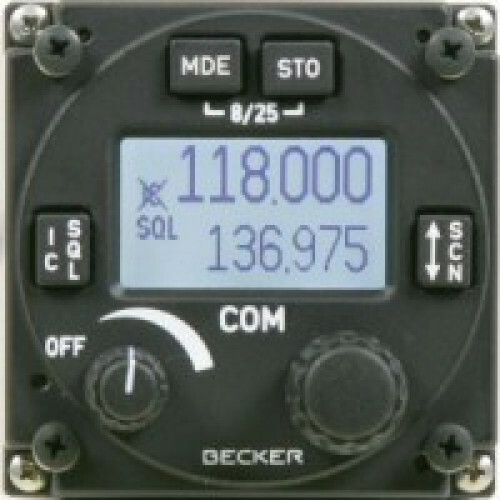 The AR6201 will continue the Becker airborne radio success story far into the 21st century. 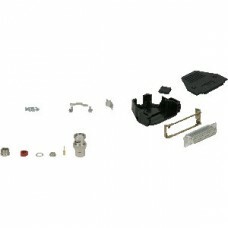 Becker supplied connector is an additional cost with two versions offered (see Becker Transceiver Accessories). A compatible uncertified connector (not from Becker) is, however, included by LX avionics with each AR 6201.